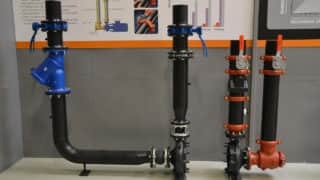 To talk more about the tools and how advanced 3D smart modeling is changing the fire protection industry we sat down with Victaulic’s Amanda Comunale. Amanda is the Director of Virtual Design and Construction (VDC) for Victaulic, where she oversees all our VDC services and offerings, including Victaulic Tools For Revit. Her lifelong background in fire protection and extensive industry knowledge make her the perfect go-to person for all things fire. Tell us a little about your background in the fire protection industry that led you to Victaulic. I came to Victaulic in 2014 as Director of Construction Piping Services (now known as Victaulic Virtual Design and Construction). I grew up in the fire protection industry and have had just about every position you can have in a contractor’s office. Immediately prior to coming here I was the VP of Operations Services at one of the largest fire protection contractors in the country where I was in charge of fabrication, transportation, purchasing, safety, lean implementation and even HR. What trends do you see in the content development, 3D modeling, drawing services and prefabrication analysis areas? In fire protection I see engineers trying to get more out of their model by using smart content as opposed to generic content. Along with that switch I see fire protection software adapting to work better with Revit given how the industry is moving towards it as the preferred platform. I think we’ll see this in the form of Revit add-ins specific to fire protection so users can get the full benefit of smart content. In terms of fabrication, which has always been strong in the fire protection market, I notice a trend to prefabricate the valve assemblies, risers and fire pumps. We all know there is this ongoing conversation about how to do more of the assembly in the shop. What do you see as far as the adoption of BIM across the fire protection industry? The fire protection industry is really moving towards full BIM utilization. In the past contractors who may have stayed away from BIM now see it as a project requirement and they’re figuring out how to gain value from the BIM process. We’re trying to educate the industry on the coordination best practices we uncovered through our years of BIM experiences. When designers and field groups communicate efficiently throughout the pre-construction process we see that the value and savings are immense. What do you think is driving that adoption of the BIM and Revit smart modeling? I think owners and contractors alike are driving it. Owners want more value out of the construction process including maximizing efficiencies and coordination. And as I said above, contractors who have experience with BIM have realized the value of coordination as well. They’ve seen less rework and fewer conflicts handled in the field as a direct result of early communication. How is Victaulic reacting to the evolution of technology and coordination? One of our latest initiatives is becoming a part of the BIM and Revit professional communities and starting the conversations to identify needs. I’m going to be speaking at BIM MEPaus and the Revit Technology Conference this year and hope to share the best practices we’ve learned over the last 30-plus years. I’ll be attending the conferences as well so I’m excited to learn from other attendees on how they’re using the new opportunities. Victaulic is also holding customer insight councils where the topic of emerging technology and the lack of education around new technology is brought up frequently. As a group Victaulic VDC has honed our service offering to line up with these customer needs. We’ve always offered a drawing service but now we’ve developed an offering that includes but is not limited to training, BIM coordination, 3D content development, and prefabrication analysis. We review BIM best practices including routing, coordination meeting discussions, and proper estimates and timelines. And training can be customized to the needs of our customers, ensuring they get the most out of each session. Recently we’ve been exploring 3D scanners and new software platforms in anticipation of new technologies so we can continue to be a thought leader for our customers. The best way I can think to explain it is when you subscribe to the newspaper in order to stay up-to-date with current events. Quickly there is an information overload and you go back to reading the front page only and the papers stack up. We understand that our customers have a job to do and we’d like to make that easier by exploring new technology for them and providing clear ways to optimize their workday. Can you explain the concept behind rich content, and what benefit does it provide for fire protection projects? Rich content contains all of the product information necessary to design, construct and maintenance a product. Because it already has all the necessary information, you can easily use our Victaulic Tools For Revit toolbar and get an estimate including bill of material, labor times and pricing. Explain the new Victaulic Tools for Revit and how to get the free trial. Victaulic Tools for Revit is designed to have key functions that improve productivity while working in Revit. It removes the excess time involved in rotating, resizing and deleting pipe, and features a procurement, custom tagging and annotation function. It’s really meant to address the modeling functions that you do day-in, day-out. You’re always deleting pipe, you’re always rotating it, resizing as the design changes, etc. Those changes happen countless times a day and the Victaulic Tools make it an overall easier and faster process. Because this is all smart modeling, the custom annotation and tagging function is huge. Right now the way you have to annotate a model doesn’t link anything together. Let’s say, if you delete a large section in the middle of your model, currently you have to go back to the beginning of your design and renumber everything. With the Victaulic Tools for Revit, these tagging changes happen automatically. You delete the section and everything before and after it is renumbered. That frees up a huge amount of time for someone working on a project. The 30-day trial is available for everyone to download on VictaulicSoftware.com. Can you give an overview of the training opportunities the Victaulic VDC team offers? The main training that we do is BIM training, for contractors with varying experience levels. The training lasts 1 to 3 days and can be conducted in your office, or at Victaulic headquarters. We review BIM best practices, along with communication tools when engaging in coordination meetings. Say for example the designer is a part of a project’s coordination meeting every Tuesday and the project is supposed to be on the fourth floor but they’re still on floor three because they haven’t gotten mechanical sign off. We also review communication best practices within your internal organization. The success of a BIM execution plan lies in the hands of everyone within your organization, and understanding how to communication that is a key to that success. The second training is on Revit. Revit training reviews topics such as family creation, family content creation, and template set up. The last training we would do is surrounding the benefits of Victaulic products.